Never seen them before, they're so colourful, I keep my eye on the bird table but nothing yet! 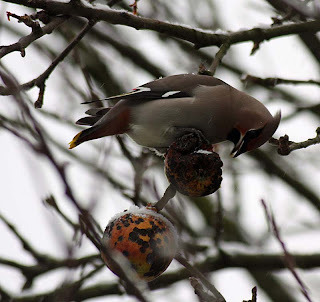 I have been thinking about the birds in Britain, knowing the snow was presenting major challenges.... What a pleasure to see there are still some apples on the trees for them to eat. I loved that you filmed them and well..I learned something new..that the large flocks are known as irruptions. I don't think I've ever seen a Waxwing. Maybe they don't come as far South as Hampshire... My birds were very pleased yesterday to get the pastry trimmings from the Mince Pies. In current weather conditions we are looking for every opportunity to share our food with the birds and animals. Aw they are gorgeous. They do look very cheeky, don't they? I love waxwings, too. I remember how I admired then when I was little. They are so pretty and it's interesting to watch how they eat berries on trees. And there is always so many of them together! What pretty pics! Thanks for stopping by even though I've been mostly missing from the world of blogs lately. I appreciate your kind comment. Hope your holidays are wonderful! looking at the pictures and video, i felt some kind of sentiments have passed thru me..thanks for sharing this. These waxwings are fussy and will not go on the bird table, even if you had a big juicy red berry there. They are not the prettiest of apples, but the waxwings are loving them. They've chomped their way through those at the top and are getting to those at the bottom now - soon there will be nout and they will be off on their merry ways. I'm sorry that the film was not the best, but sadly that is all I could do with my camera - a bit like a mobile phone camera :( It showed though, their presence in large numbers. Sweet holiday wishes to you. Oh your birds are being spoiled with your pastry trimmings. Did they get a little taste of the Mincemeat inside?! I've been leaving some dried currants on the bird table for the robin. 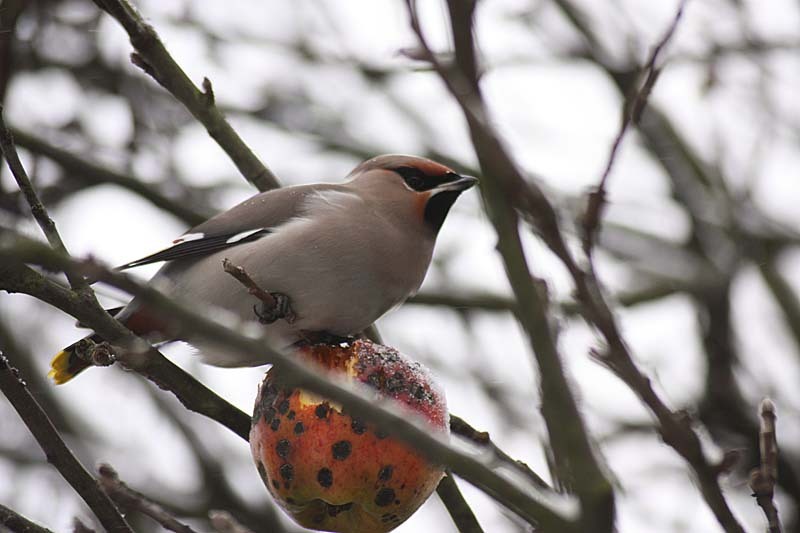 So lovely to have read about your memories and experiences of watching waxwings. Thank you for repaying the compliment Martha (MM). Hope your holidays are wonderful too! Thank you so so much lena for your lovely comment. I sincerely hope you have a wonderful Christmas too. We are always excited to see them. Shame the film is not that clear. Your waxwing photos are great - lovely birds. We have plenty of redwings and fieldfares here but haven't seen any waxwings. I don't think I|'ve seen a redwing here, but we have a couple of fieldfares and mistlstoe thrush fighing over whats left hanging in the trees.